Sometimes it’s difficult to tell if your aging loved one is getting enough of everything they need, be it food or drink, warmth, comfort–anything, really–because they may be unable to tell you. If you find yourself in the position of caregiver for a beloved vulnerable senior, you may be unsure of how to properly care for all of their needs. That includes dental care for seniors. 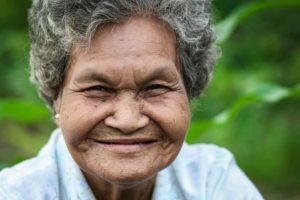 It’s important to understand, that although you may feel like it, you are not alone in having to figure out how to get the best dental help for vulnerable older patients. Watch their food intake, making sure they are eating healthy foods that will benefit not only their oral health but their overall health, especially if they wear dentures. These daily oral care tasks may be impossible for them, and very difficult for you to help them, especially if they are uncooperative due to fear or neurodegenerative diseases such as Alzheimer’s or Dementia. Geriatric House Call Dentistry is your advocate when it comes to senior dental care. Dr. Alisa Kauffman of Geriatric House call Dentistry is in your corner–and at their bedside––bringing with her the highest level of compassion, expertise, and experience you would want in dental care for seniors. With her knowledge and decades of experience, Dr. Kauffman offers your aging one loved the care they deserve. Providing adequate dental care for the aging, vulnerable community is Dr. Kauffman’s life calling. She cares deeply for her elderly patients and her passion for what she does shows through her work. The heartbeat of her practice is to make a difference in the life of her patients. Her trustworthiness and tender, gentle way with this community is unparalleled. It’s no wonder that Dr. Kauffman has been named one of the country’s top 25 dentists! You can see why here. If you have been looking for excellent dental care for seniors, your search can end in the capable hands of Dr. Kauffman. Give her a call today at (917)826-6278 to schedule a consultation. You can breathe a sigh of relief knowing that you and your aging loved one have a qualified, highly trained, compassionate expert in your corner.